—Mike Orenduff, Author of the Pot Thief series. 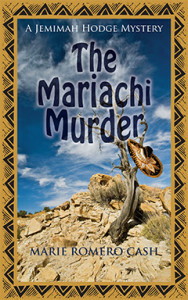 “The Mariachi Murder offers readers the pleasures we have come to expect from her Jemimah Hodge series: a vivid physical and cultural landscape populated with true-to-life characters in a fast-paced story.” Read more…. “A great read, packed with vignettes of the food and landscape of the area.” Read more…. A popular mariachi singer is found shot and buried south of Santa Fe near Cerrillos, putting him in the jurisdiction of Detective Rick Romero and Forensic Psychologist Jemimah Hodge. Eduardo Sanchez had a massive ego that could well have gotten him killed, considering his penchant for reckless womanizing. However, as the weeks pass, the trail grows cold, increasing the pressure on law enforcement. Was the mariachi killed by a spurned girlfriend or an angry husband? Why was he traveling back and forth between Santa Fe and Mexico? Although Rick and Jemimah have been dating for two years, they have yet to commit. So when Rick’s beautiful ex-wife breezes into town and makes a play for him, she stirs up trouble all around. Meanwhile Jemimah receives her own unwelcome visitor: a friend of her FLDS family who’s tracked her down and wants to dredge up the past. To add to the drama, Detective Romero’s wayward ex-con brother Carlos lands in deep trouble when he hooks up with a woman hiding her checkered past. When the clues come together, they intersect in volatile ways no one could have foreseen. Marie Romero Cash was born in Santa Fe, New Mexico, and has lived there most of her life. In her mid-thirties she discovered the traditional arts of northern New Mexico. After twenty years of creating award-winning art, she began to write about it. At fifty she enrolled in college and, five years later, graduated with a degree in Southwest Studies. In 1998, she received the prestigious Javits Fellowship to pursue her education. Since then Marie has written several books about the art and culture of the southwest, including a memoir about growing up in Santa Fe. Click here to find Marie on the Web. He pushed against the glass door. A sugar rush flooded his nasal passages as he walked past a counter laden with freshly baked pastries. It was a small establishment but apparently popular, as almost every table was occupied. The walls were decorated with colorful paintings of multi-layered cakes and frosted cupcakes. He couldn’t miss Julie. She was waving her arm and then stood as he walked toward her table. She reached out to embrace him. He noticed the recently showered scent he used to love about her. It appeared she hadn’t gained an ounce of weight over the years. They walked to the counter, where he ordered black coffee and Julie ordered a large vanilla latte with extra whipped cream. He took a seat across from her at a corner table. They sat in silence as he sugared his coffee and gave it a stir. She was even more beautiful than he remembered. She smiled at him. Her lips were full and moist, her eyes an intense green darker than jade. Her hair was a deep piñon brown, laced with golden highlights. Her skin was smooth and flawless. She looked younger than her age. But why had she returned to Santa Fe? They had lived together the entire five years of their marriage. She hated that he was a cop. Her figure was perfect. In a whirl, his mind shifted from one thought to another. He recalled he had been drunk most of the time following their breakup and still hadn’t forgotten the day she left. There was a faraway look in her eyes … or was he just imagining things? She was smartly dressed in tailored pants and a loose silk jacket over a contrasting shell. Conservative, yet she managed to pull off a certain effortless sexiness.